It's starting to look like fall in some parts of North Texas. Trees are already changing color in order to survive the hot and dry conditions felt over the last few months. "The same process happens then (in fall); we're just seeing it earlier now because of the stress of our heat," said Brian White, certified arborist for Arborilogical Services. 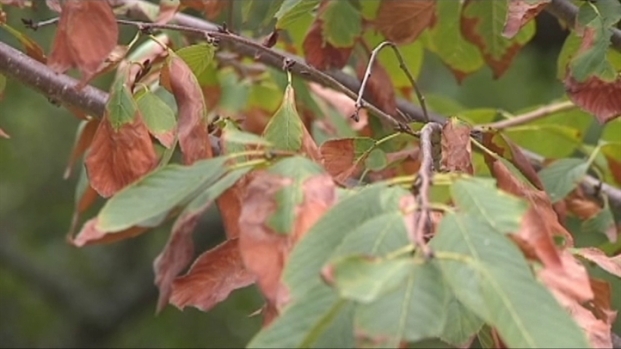 The drought is affecting the rate at which the color of some tree's leaves are changing. "We're not going to lose all of our trees because of this. This is a way they're trying to protect themselves, preserve themselves, so they're going to prepare themselves for dormancy a little earlier than most years," he said. Regular visitors to the Fort Worth Botanic Garden said the early change in color hasn't gone unnoticed. "I've just noticed that a lot of them are green, but a few of them are brown from the heat -- you know, not quite as beautiful as they usually are," said Adria Dobson. The oldest botanic garden in Texas can't beat the heat, which has had a bigger impact than the drought alone. "When it's so hot, you really can't put down enough moisture to compensate," said Robert Bauereisen, grounds supervisor for the Fort Worth Botanical Gardens. And with watering limitations, the garden has lost a few trees, such as a large magnolia tree near the restaurant and education center. Such losses of trees and changes of colors may only be the beginning, Bauereisen said. "We're expecting for the next two or three years to see problems with the landscape. The problems we're seeing, we're going to continue to see," said Bauereisen. He said trees that aren't showing effects of the drought now might after the winter as the drought is prolonged. In the meantime, people already seeing fall colors on their trees are encouraged to keep up regular watering because there really isn't much someone do, given the heat and dry weather. "Every now and then, [give them] a good soak," said White. He said people concerned that their tree could be dead should contact an arborist. The ultimate way to get trees back to health is through cooler temperatures and rain. If a tree has died it is likely because it was distressed or unhealthy before drought conditions started.